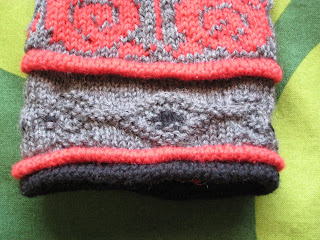 A week to the day after I completed my mittens, I’ve finally got my blog back on. Yarn: Dalegarn’s Baby Ull, just under one skein each 3718 (maraschino) and 0007 (grey), plus a small amount of 0090 (black). The latter two came out of my stash. 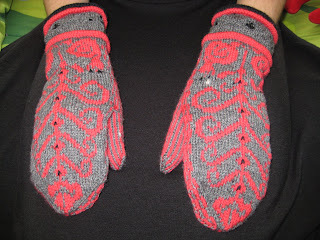 Needles: I ended up using the called-for 0’s for the grey section in the second mitten, but did all the rest on 1’s. Definitely use five, even if you normally use four–it helps keep track of the pattern. Modifications: I moved the thumb up from row 26 to row 35, as noted previously, and in spite of my many anxieties, it worked perfectly. In short, I am glad I decided to go with a German chocolate cake knit rather than a candy bar knit. I crossed the Fair Isle frontier with project and sanity intact. 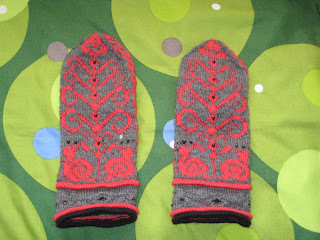 The only real fault I could find with the finished product is that the left mitten is slightly larger than the right. That’s sort of a non-mistake, though, because, as a lefty, my left hand is actually more robust than my right anyways. Having tried all these new techniques–tuck stitch, Fair Isle (done properly), afterthought thumbs, and duplicate stitching–I feel like I’ve broadened my horizons, but I’m pretty sure that none of these techniques will enter my regular repertoire. My norm is a little closer to the “simple knits” end of the spectrum: solid colors, basic patterns, clean lines. German chocolate cake is good for special occasions, but candy bars are definitely better for everyday. Do! They were so much fun. And I agree: the details definitely make this project. oh, i love these! the little snails are so cute!